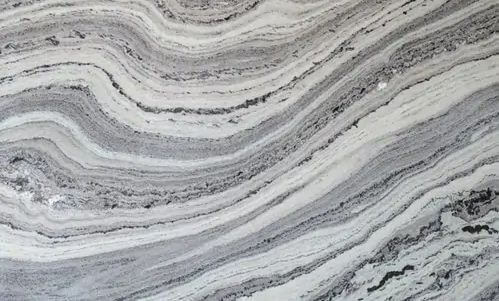 Mercury White Marble base color is white with a black and grey color wave pattern across the slab. The pattern is rare in nature and is appreciated globally. It is used in making kitchen countertops, vanity countertops, wall cladding, and flooring as well as for fireplaces and bathtub surrounds. Mercury White Marble is such a hard marble. It is well suited for kitchen countertop use. Mercury Black Marble is hugely admired by interior designers, builders, and architects; this gives an attractive and alluring touch to a site wherever they are fitted. Kushalbagh Marbles Private Limited, located at Banswara, is the biggest manufacturer, supplier and exporter of Mercury White Marble. We are supplying Mercury White Marble to all over India and have also exported it to more than 20 countries around the world. White Wave Marble, Mercury Marble, White Wood Marble, Mercury White Marble From India. To fill out the enquiry form, please click here to get the best quotation for Mercury White Marble.